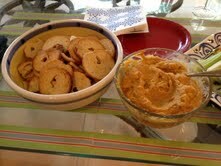 When I posted the recent recipe for Sweet Potato Hummus, I didn’t have the recipe that our hostess, Bonnie, prepared - so I created and shared my own. After reading my post, Bonnie quickly sent me the recipe she served. 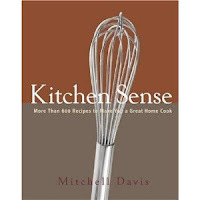 The recipe, which she found in the Sun-Sentinel newspaper, is credited to Mitchell Davis, author of the cookbook ‘Kitchen Sense’. Bonnie added a few of her own touches to the original recipe; her notations are in red. 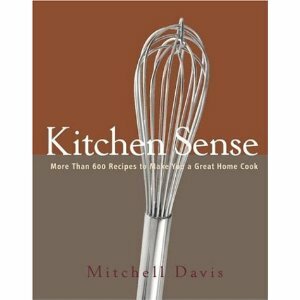 Barely cover potatoes and leaks with broth; bring to boil and simmer until potatoes are fork tender. Pour off some broth. Remove fresh thyme sprigs. Before serving: Squeeze juice of 1 lime or lemon over the top. Bonnie noted: I thought it needed to be peppier, so I added 1 tsp. cumin and about a quarter teaspoon red pepper flakes at the end after tasting it.